Payments are handled through PayPal. You can set your delivery/billing address(es), configure your credit/debit card information and manage your purchases through their secure, easy-to-use website. If you prefer a different payment method, please contact us at support@cedeq.com. We ship worldwide! Orders are usually shipped via Canada XpressPost (with insurance and tracking number) within 1 business day of receiving the payment. The order will be shipped to the PayPal address specified in the payment. If you would like your order shipped to a different address, please make sure to change your address in PayPal before making the payment. This is required by Cedeq and PayPal for your protection. We charge a fixed shipping fee of $15 per order, so you can save when ordering more than one AHK Enterpad at the same time. Please note that no documentation is shipped with the AHK Enterpad. See this online User guide for up-to-date documentation. We are confident in the quality and value of the Enterpad, and we are happy to provide you with an unconditional return policy. You have a full 15 days to use your new Enterpad and make certain you are 100% satisfied. Then, if for any reason you want to return your Enterpad for a refund (or exchange for a different model), just contact us for a return code and send it back within the following 7 days, and we will quickly process your refund, minus shipping costs. The Enterpad includes a one-year warranty against defects and/or malfunctions, effective from the date of purchase. The warranty covers all parts and labor costs. We will either repair or replace the Enterpad. The warranty does not cover damage as a result of misuse or unauthorized modification. The Enterpad is a specialized device produced by a dedicated team at Cedeq. There may be minor cosmetic imperfections on the product resulting from the process of manual assembly. Such imperfections should not be seen as defects. The Enterpad meets Canadian and American standards (ACNOR 108.8-M1983, code FCC, section 15-1989) with respect to electromagnetic radiation emissions for class A apparatus. Testing was done in conformity with ANSI C6.4-1991 procedure requirements. We add applicable taxes for sales in Canada. We do not add taxes or custom duty for sales outside Canada. In most cases, these charges are invoiced by your country’s customs office. The Enterpad is made in Canada; HS Tariff Classification Number 8471-60-99. In accordance with the Free Trade Agreement between North American countries, Cedeq's Enterpad is available duty-free in Canada, the United States and Mexico. Founded in 1989, Cedeq Industries Inc. is a Canadian computer engineering company. Its mission is to design and produce input devices that allow people to work more efficiently with computers and industrial tools. We have been developing and manufacturing the Enterpad since 1990. If you have any questions, please call us toll free (Canada/USA) at 1-888-462-3988 or contact us at support@cedeq.com. No conflicting hotkeys. The AHK Enterpad triggers AHK scripts without using Windows hotkeys. Therefore, there is no possibility of conflict with them. No key presses lost. The AHK Enterpad automatically buffers (holds) its key presses if the linked AHK script (or Windows) is busy. Therefore, there is no need to worry about key presses being lost. Plug it in and get started. 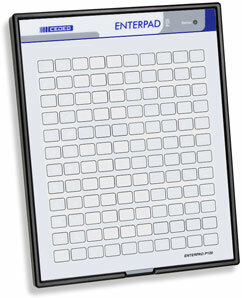 The AHK Enterpad is installed like a traditional USB keyboard. It doesn't require a special driver. Just plug it in and use it with our streamlined AutoHotkey script template. Our AutoHotkey script template will magically link to the plugged-in AHK Enterpad.